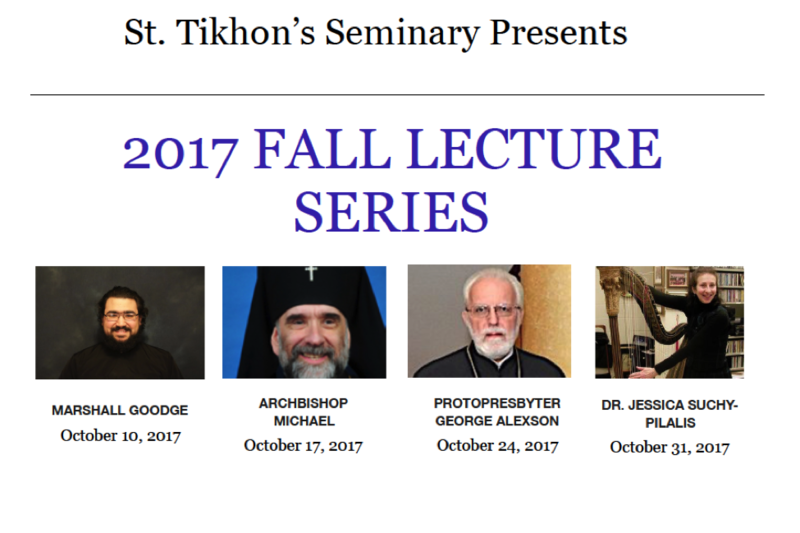 [STOTS Communications, South Canaan, PA] St. Tikhon's Seminary announces its annual Fall Lecture Series. This year's series is focused on "Back to Basics". The series will run on Tuesday evenings: October 10, 17, 24, and 31, beginning at 7pm in the seminary refectory. You can download a flyer to post here. His Eminence is the Archbishop of the Diocese of New York and New Jersey, and Rector of St. Tikhon’s Seminary. He is Professor of New Testament and Pastoral Theology and Department Chair of Scripture at the seminary, and holds a Ph.D. Degree from Duquesne University. Fr. George (STOTS 1969) has been a priest in the Greek Orthodox Archdiocese for forty-eight years. He retired in 2010 from the Annunciation Cathedral, Atlanta, GA. Upon returning to Northern Virginia, he accepted an invitation to assist in developing Holy Apostles Greek Orthodox Church, in Loudon County. Dr. Jessica teaches at the Crane School of Music, Potsdam University, Potsdam, NY. She is currently on sabbatical and has recently returned from Greece. She is also an accomplished harpist in addition to her work in liturgical music.